Life can be so stressful, even when you’re not planning a wedding. Work schedules, exercise schedules and fitting in some ‘couple time’, as well as wedding planning, sometimes adds up to feeling rushed and overloaded. You don’t even have the time to run to the shops and gather your supplies for a relaxing pamper session at home? 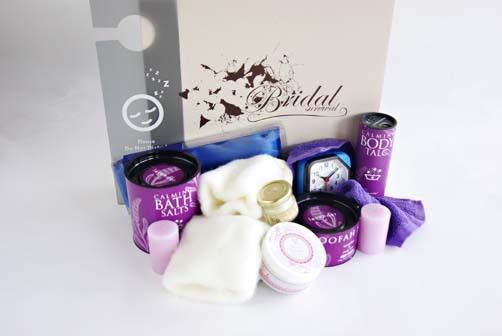 That’s why we at Bridal Survival have just relaunched our ever popular Bridal Eve Kit! Filled to the brim with lavender bath products, we encourage you to make yourself a cup of Camomile tea with the sachet provided in the kit, light the candles and slip into a deep warm bath and luxuriate. Afterwards, feed your skin with lavender body butter, slip on your favourite PJs, pop on our thick fluffy socks and eye mask and crawl into a warm bed to sleep the night away. All you will need for a relaxing night in – dreams not provided! We originally created the kit to ensure you have a great sleep the night ebfore your big day, but we think it’s just as lovely any time during the wedding planning process!